Norway’s Grand Fjord (Storfjord), where the surging north Atlantic Ocean meets the majestic Sunnmøre Alps where a giant ravine like fjord carries the surging ocean inland banked by steep sheer walls that give way to towering peaks. 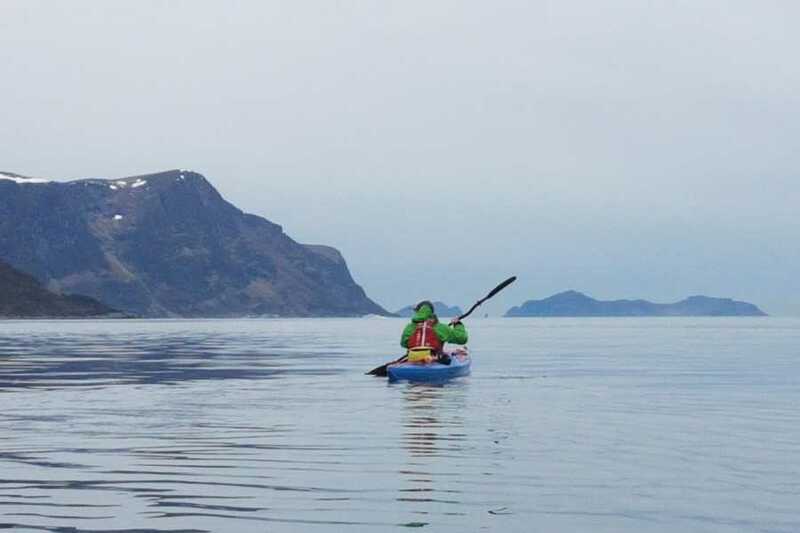 Feeling small in our sea kayaks as we glide out onto the fjord waters and the over-whelming majesty of our surroundings hits us with a view like a painted canvas of deep blue water, lush green forests giving way to chiselled rocky peaks, and an endless blue sky with wisps of white. Here, the history and culture of a rugged mountain people and the waterways that connected them come alive as we paddle these majestic waterways. Kayak More Tomorrow is a fully accredited sea kayak tour company; we know that getting going is what it is all about. Therefore, all our tours begin with our driver picking you up at your scheduled meeting point for the short drive out to our staging/launching site. Here, your guide is waiting for you and without further ado you will gear up and get going. You may leave any extra bags, clothing, etc. that you don’t want to take with you on the trip with us at the launching site. Also, if you have forgotten anything like sun screen, water, etc. we will be able to help you out here as well. The coastal waters of western Norway boast some of the best sea kayaking on the planet. Here outer islands break the surge of the North Atlantic before it descends long deep fjords winding through granite spires rising like giant monoliths from the foaming sea. Norway’s Grand Fjord (Storfjord), where the surging north Atlantic Ocean meets the majestic Sunnmøre Alps where a giant ravine like fjord carries the surging ocean inland banked by steep sheer walls that give way to towering peaks. Feeling small in our sea kayaks as we glide out onto the glistening fjord waters the over-whelming majesty of our surroundings hits us with a view like a painted canvas of deep blue water, lush green forests giving way to chiselled rocky peaks, and an endless blue sky with wisps of white. Here, the history and culture of a rugged mountain people and the waterways that connected them come alive as we paddle these majestic waterways. Our kayaks glide effortlessly as we explore to fjord waters, we search out a little know sport to land for a delicious picnic lunch before slipping back on the water. Our driver will be at the agreed upon meeting point about 15 minutes prior to our arranged meeting time.